I absolutely love first looks and at this Liberty Grand wedding, I captured one of the most emotional unveilings in my career as a Toronto wedding photographer. Right before the outdoor wedding ceremony at Liberty Grand, the bride and groom for each other for the first time on their big day. At the beginning of my wedding photography career, I learned that the first look is a wonderful opportunity for a professional photographer to capture beautiful moments between the bride and groom. Many couples prefer to see each other when the bride is walking down the aisle. However, during my consultations I advise the bride and groom to allocate 10 minutes on their special day for the first look. By doing that, the bride and groom experience beautiful emotions that I can transform in outstanding photographs. My photography style is mostly documentary and with little direction I am able to create photographs that the new family will cherish forever. There are two different ways in which I coach the couple to have their first look. First, I suggest that only the bride and groom are present (besides the wedding photographers and videographers). The advantages of this approach is that the couple can spend a few minutes together before the ceremony. That is usually followed by a short photo shoot when I advise the wedding party to join. A second, more elaborate first look, requires the presence of the couple's immediate families and the bridal party. Usually, either the bride or the groom wait for the other to come. If the bride has a wedding dress with a long train, I position her in such way, that the groom comes behind her. At the appropriate time, the sea each other. I always emphasize the importance of leaving their emotions flow freely. If they feel like crying advise them to cry. If they want to laugh, I encourage them to laugh. On this special day, I asked the bride to wait for the groom. In this particular photograph, which occupies a full spread in the wedding album, we can see the bride waiting for the love of her life, who is walking fast towards her. It is a known fact that or original angles and leading lines contribute to great photograph. Here, the pathway on which the bride and groom are positioned forms a line parallel to the baroque diagonal. That gives the image dynamism and a sense of motion. I often try to shoot at the low shutter speed so that the groom looks a bit blurred to emphasize the fact he's walking. The colours in this picture are muted. I chose to desaturate this photograph so that the viewer's attention focuses on the two subjects, the bride and groom, rather than the beautiful buildings and gardens. To ensure that both protagonists of the scene are in focus, I photographed the image at F11. Because on the wedding day I love focusing on moments rather than camera settings, I photograph this image in Aperture priority mode. That allows me to change the aperture and depth of field in a fraction of a second depending on the situation. Even more, I do not need to worry about the sudden changes in light. There are two schools of thought in wedding photography when it comes to shooting modes. The old school claims that everything as to be photograph in manual mode, otherwise you are not a professional photographer. 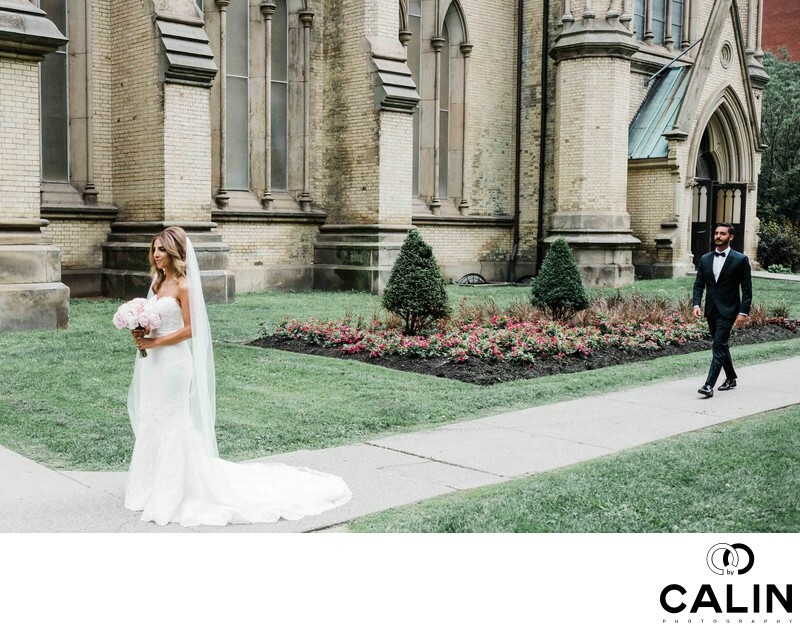 The new wave of wedding photographers in Toronto adopt a more laid-back approach embracing the aperture value mode. In my opinion, what defines a professional photographer are the results, the moments the artist captures and not the tools or the techniques. As such, I strongly believe that regardless of the techniques, the photographer should deliver an artistic depiction of the special day. What makes this particular image stand out is the composition and the particular moment before the bride and groom saw each other. As such, post processing becomes secondary. As usually, I colour corrected the image, applied a film preset, desaturated the scene and applyed a selective vignette around the bride and groom so that they become the main focus of the photograph.